I can't figure out why the output voltage of analogWrite(255) is less than the voltage of digitalWrite(255). My code and an image of my setup are below. 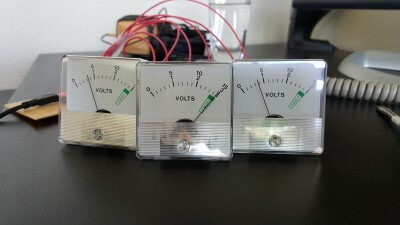 Some other useful information is that I am using the NodeMCU by HiLetgo, 3.3k ohm resistors with the meters, and that the meters use 1mA of current DC at full scale. Thanks for your help! First, do something simpler, and eliminate possible causes. Are you certain the NodeMCU's CPU is an 8bit PWM? If it were 9bits, it would read about 50% full scale, and 10bits would be about 25% of digitalWrite (which is what I think I can see on the photo). Swap the analogue meters around, and see if the difference is consistent with the pin, or consistent with the meters. Use a digital multimeter (DMM) to measure voltage. It should be a small load. So this should eliminate, or identify, the analogue meters as a culprit. Then swap 9 and 10. If the DMM shows the analogue output is consistently lower, then go back and check that PWM is 8 bits, and the device output range for PWM is the same output voltage as digitalWrite to a GPIO. Not the answer you're looking for? Browse other questions tagged analogwrite digitalwrite or ask your own question.